June 26 — Human rights activists marched from the New York Times offices to the Empire State Building — which houses Human Rights Watch — to protest both institutions as tools of the CIA, specifically in their role attacking the Bolivarian government of Venezuela. 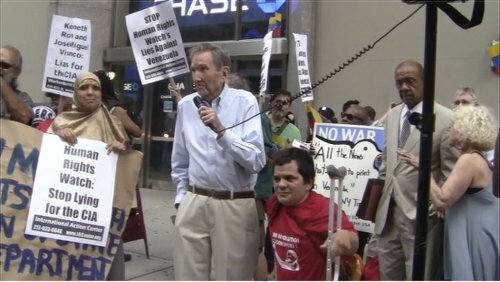 A delegation of human rights activists, including Ramsey Clark, former U.S. attorney general; attorney Michael Tarif Warren; Suzanne Ross of the New York Free Mumia [Abu-Jamal] Coalition; William Camacaro of the Alberto Llovera Bolivarian Circle; and Sara Flounders of the International Action Center, accompanied the march and attempted to deliver a protest letter to the HRW. The HRW refused it. 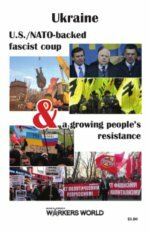 Organizers said that HRW’s arrogance in refusing to accept the message is a further example of the fraudulent role they play by actually protecting U.S. corporate power and business/military interests in countries targeted by the U.S. for destabilization. Clark, Warren, Camacaro and Flounders then delivered the national petition to an appropriate stand-in for HRW, the inflatable giant rat often used to point out scab and union-busting work sites, but positioned today in front of the HRW office. The use of the rat for this protest of HRW’s role was an important sign of union solidarity with the people of Venezuela. The letter also criticized HRW for waging a campaign against the Cuban Revolution and slandering that country, and, on the other hand, of ignoring serious human rights violations in Haiti, Honduras and other countries that are more closely allied with the U.S.
A video of the demonstration can be seen at youtu.be/j7Std8u3tjQ.